As we move forward with the weight of purpose upon us, we still ourselves, and steel ourselves for the journey. Envisioning our goals, focused on feeling the elation of reward and attainment, we are ready to reap what we sow. Meditation: Everything I expect, I experience. I manifest all good things one breath at a time, one step at atime. Jesus is nailed to the cross in the eleventh station. What happens to Jesus here is excruciating. I can feel my own fingers flinch when I think of the spikes being driven through his wrists. I can imagine the irritation of rough wood scraping and leaving splinters in the flayed, raw flesh of his back. This is the point in Christ’s ordeal that is too awful to imagine. While the circumstance in the historical crucifixion is brutal and gruesome, something amazing is happening to the spirit at this station. The pilgrim becomes perfectly aligned to their life’s purpose–the self becomes indistinguishable from the ideal. The condemned man and his cross become one fixture, and the pilgrim and her source become inseparable in this melding. The Roman numeral gives a sense of what is happening. Looking at the numerical progression of the last three stations, IX, X, and XI, notice how the ‘I’ moves. It transistions from being on the verge of transcendance, disappearing into its heart essence, and finally emerges on the other side of the transformation. Numerologially, 11 breaks down to 2, and as a master number, it’s a 2 with a loftier vibration, so to speak. 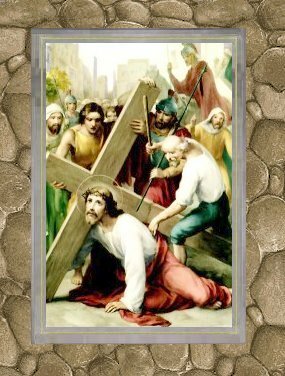 In the second station, you’ll remember that Jesus accepts his cross, and at that stage his cross, his purpose is external, it is something outside of him, separate from him, and also a thing that oppressed and burdened him. Now, instead of having to carry his cross, it carries him. Instead of crushing the deluded self, it has raised up the transcended and awakened soul. We trudge through the dream of separation, where our circumstance is heavy, and awake transformed, liberated in our understanding of our true essence, our powerful core, uplifted by who we really are and all we are capable of. This is our Wizard of Oz moment, when we understand that we’ve always had the ability to go home, that we can go anywhere, manifest anything just by believing that we can, and wanting it that much. Station 11 has brought us back to the third chakra, located at the solar plexus. The energy at this vortex keeps us focused and aligned with our goals and desires. If we see our goals not as something outside of ourselves, having to chase them or having to suffer to earn them, but rather feel them as being apart of our lives in this very moment, then we experience miracles at every turn. You are currently browsing the archives for the third chakra category.